Imputed income is a process used to determine what someone’s income “should be” taking into account their skills, circumstances, ability to work, or refusal to work. Imputed income is also a way to address a purposeful effort to hide income. Imputation of income is an issue that frequently surfaces in alimony or child support cases. This can affect both sides of an issue: the person that will receive money and the person that will pay money. support can also be awarded. When a court makes these important decisions, it usually does so after taking the finances of the parties into consideration. For example, a child support amount is ordered after the court determines the income of the parties; where one ex-spouse has a financial need for spousal support and the other ex-spouse has the financial ability to pay alimony, a court may order spousal support. In either case, the parties will submit information concerning their income to their attorneys and to the court. This may require the parties to submit W-2s, earning statements, paystubs, and other evidence of their financial earnings. Suppose one ex-spouse fears he or she will be ordered to pay too much child support and instead decides to quit his or her job. Or an ex-spouse balks at the idea of having to pay the other ex-spouse alimony and instead decides to accept part-time work. In these types of situations, the court may impute income to the spouse and order that he or she still pay child support or alimony. What Does It Mean to “Impute” Income? When a court “imputes” income, it is essentially assuming that the party has a certain amount of income, even if he or she does not, in fact, have such income. To put it another way, when a court “imputes” income to one ex-spouse or the other, the court is treating that ex-spouse’s financial situation as if that ex-spouse did, in fact, make the additional income. For example, suppose that Gloria has been informed that she will need to pay child support in her Florida child custody case. Because she does not feel she should have to pay anything, she decides that she will leave her present employment – at least until the child support order has been calculated and entered based on her unemployment. Then she intends to resume work so that she can keep more of her paycheck. Gloria’s ex-husband becomes aware of this plan, however, and brings it to the court’s attention. When the parties come to court and Gloria attempts to argue for a lower child support payment because of her “unemployment,” the court can impute income to Gloria and order her to pay a higher child support amount. When Does a Court Impute Income? Florida courts will typically impute income any time they feel that the financial picture one or both parties represent is not accurate. The court may impute income either on its own or it can impute income at the request of one party. The court generally imputes income not only as a matter of fairness (to keep one party from gaining an unfair advantage over another party) but also as a means of punishing a dishonest party. In determining whether to impute income, a court can consider a variety of information and evidence, including tax returns, pay stubs, and other evidence from the parties’ employers. n the example above involving Gloria, the court may have decided to impute income to Gloria despite her voluntary unemployment as a matter of fairness. The court may have decided that it was not fair to allow Gloria’s ex-husband to bear the entire burden of child care-related costs by himself just because Gloria voluntarily left her job. Or the court may have divined Gloria’s true purposes in leaving her job voluntarily. By imputing income to Gloria, the court is able to send a clear message to Gloria that she cannot escape responsibility for supporting the couple’s child simply by leaving her job. But suppose that the court is unfamiliar with Gloria and her ex-husband, and therefore believes that Gloria is unemployed not by choice but by circumstance. If Gloria’s ex-husband believes that the court is not going to impute income (or will only impute a minimum amount of income), the ex-husband may make a motion to the court asking that a court impute a higher amount of income to Gloria. 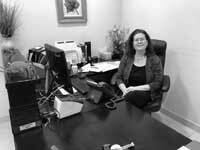 Get to know us: Jeana Vogel, Esq. In either case, a court will not impute income to a party without allowing that party an opportunity to be heard by the judge. If one of the parties is asking the court to impute income to the other party, the requesting party bears the burden of showing not only that it is proper for the court to impute income, but also in what amount. In the case of Gloria and her ex-husband, for example, if the ex-husband asks the court to impute income to Gloria, he will need to show not only that the court should impute income to her, but he will also need to prove what amount of income the court should impute. If the husband fails to convince the court as to the need or amount, the court may decline to impute income. What Amount of Income Will a Court Impute? Once a court decides to impute income to one party or the other, a court has a great deal of discretion in determining the exact amount of income to impute. Generally, a court cannot impute more income to a party than the party has historically made (the only exception to this is where a court imputes income to a party who has historically not worked at all). In Gloria’s case, if the court finds that the evidence clearly shows she made no more than $50,000 per year in her lifetime, the court may not impute $60,000 or $70,000, regardless of how deceptive Gloria had been with the court or her ex-husband. In determining what amount to impute, the court can draw from information showing the past earnings of the parties as well as official statistics and information (for example, from the government). In looking at these resources, the court will be attempting to determine what the party could be expected to make given the party’s past employment history, his or her education and skill level, and the job growth outlook for that particular industry. In Gloria’s case, suppose the court discovers that over the past five years Gloria routinely made between $40,000 per year and $50,000 per year. The court may choose to impute $50,000 to Gloria in determining alimony and child support payments. Supposing further that the court noted that government information indicated that individuals in Gloria’s career field were expected to earn less over the upcoming years, the court may instead choose to impute a lower amount of to her. Where there is no evidence of prior earnings for an ex-spouse – for instance, if one ex-spouse never worked during the marriage – the court may treat that party as if he or she is working a 40-hour per week job at the state’s minimum wage. For example, suppose that Rose and Danny were married for five years before Rose filed for divorce. During the course of the marriage, Rose did not work but rather stayed home to care for the children. When the court considers what amount of child support (and possibly alimony) to award to either of the parties, the court may treat Rose’s financial situation as if she was working full-time at a minimum wage job. This may result in any alimony or child support award being reduced. Are Certain Behaviors Likely to Lead to the Imputation of Income? Two types of behavior – voluntary unemployment and voluntary underemployment – are most likely to lead a court to impute income. Voluntary unemployment occurs when a person deliberately terminates his or her employment without a good cause. It can also occur when a person acts in such a way that he or she is terminated from his or her job. An ex-spouse that simply turns in his or her resignation and chooses not to pursue other employment is considered to be unemployed voluntarily and is at a greater risk of having income imputed to him or her. Likewise, an ex-spouse who simply refuses to show up to work and ends up being fired for absenteeism is also considered voluntarily unemployed and is more likely to have income imputed to him or her. Voluntary underemployment occurs when a party is capable of earning more income but voluntarily chooses to forego such an opportunity without a good reason for doing so. For instance, an ex-spouse who is offered a promotion or raise but chooses not to accept it may have additional income imputed to him or her. In a similar fashion, a party that voluntarily reduces his or her work hours without a good reason for doing so may also have additional income imputed to him or her. How Can Imputed Income Affect My Child Support or Alimony Order? One of the chief determinants of child support and alimony awards is the income of the respective parties. If the court imputes income to one party or the other, this can affect the amount of child support and alimony the other party receives – or whether he or she receives any alimony at all. A party to whom the court seeks to impute income will generally wish to fight such imputation; the other party will likely support the court’s attempt to impute income. For instance, suppose that Rose and Danny are divorcing. Rose has not worked during the marriage; Danny has always been the sole breadwinner for the family. A court considering this situation may award Rose alimony (suppose the amount is $800 per month). But now suppose that the court believes Rose could earn an income despite the fact that she has not done so during the marriage. The court may impute income to Rose, lowering the amount of alimony that she receives. Do I Need an Attorney to Help Me? Alimony and child support decisions are dependent on the incomes and financial situations of the parties. A party whose ex-spouse is voluntarily unemployed or underemployed may find that his or her child support award is not as high as it should be, or that an alimony award that should be awarded is not. An Ayo and Iken attorney can help a party in this situation uncover evidence of the other party’s true income and financial situation. By alerting the court to the fact that the other party may be concealing assets or purposefully limiting his or her income, a court can then impute the appropriate amount of income to the deceptive ex-spouse and ensure the other ex-spouse receives a fair and just child support and/or alimony award. Conversely, an ex-spouse who is voluntarily unemployed or underemployed will need to be prepared to explain his or her circumstances to the court or else he or she may have income imputed to him or her. Perhaps the party’s unemployment was voluntary but the party left a particular job because of a hostile work environment. Or perhaps the party was offered a promotion and raise, but in order to accept such a position, the party would need to relocate away from family. These are important circumstances that the court should consider before imputing income to the party. An attorney can present these circumstances to the court along with important, corroborating evidence to show the judge why imputing income may not be appropriate. Imputation of income is a step the court may take either upon the request of a party or on its own when it appears that one or both parties are not being forthcoming about their true financial picture. A court is more likely to impute income in the case where a party appears to be either voluntarily unemployed or voluntarily underemployed. Depending on the amount of income actually imputed, the amount of child support or alimony that a party is ordered to pay can be affected. Helped me out completely…made my life a lot easier… Best of all Jason Ponder was 100% honest throughout the whole process & did everything based on what I really needed instead of just breaking the bank… Will definitely recommend him to any & everyone! !